The bikers superstore for your helmets, boots, leather, textiles, gloves and accessories. XS and XXL on special order only. Item will be supplied with pinlock. Peak is adjustable and removable. Helmet got internal sunvisor for better visibility. Support for top and side action camera. Night vision - Reflectors on side and back of the helmet. 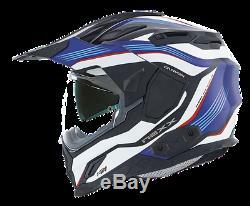 D1 Adventure DVS Dual Sport Motorcycle Helmet Canyon Blue- XD 1 + Pinlock" is in sale since Saturday, June 10, 2017.